The Clwyd Motor Company in St Asaph, North Wales. Homepage. This page: A purchase invoice issued to a Dr. H.C.L. Stocks of High Street, St Asaph, North Wales. Rover sold by Clwyd Motor Company in 1925. This pencil-written invoice was created on the 21st May 1925, and handed over to a Dr. H.C.L. Stocks of High Street, St. Asaph. Full payment (£211 7s) was made for the Rover motor-car that same day, judging by the receipt attached to the invoice. 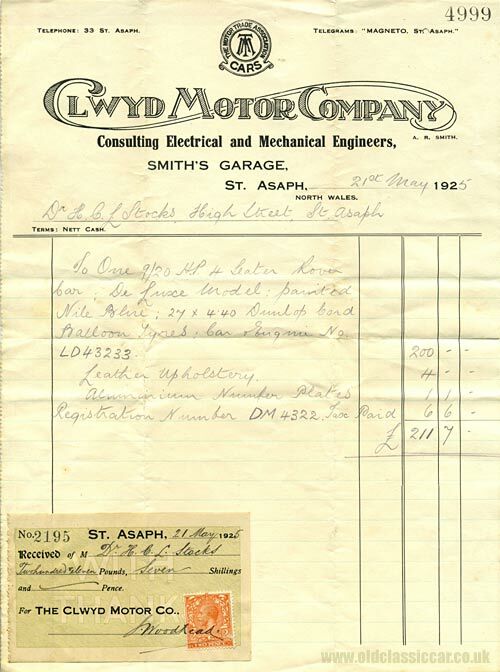 Clwyd Motor Company was run from Smith's Garage of St. Asaph, North Wales, and the firm was a member of The Motor Trade Association. If you'd wanted to contact Clwyd Motors, you could either telephone St Asaph 33, or else send a telegram to "Magneto. St Asaph". Details on the invoice confirm that Mr or Mrs Stocks handed over £211 7 shillings for a "9/20hp 4 seater Rover car - De Luxe model". The vintage Rover was finished in Nile Blue, and supplied with new 27 x 4.40 Dunlop Balloon Tyres. Engine number was LD43233. Leather upholstery was also fitted, as were aluminium numberplates for registration DM 4322, a Flintshire series used from 1903 right through until mid 1936. A look on the DVLA site doesn't bring up any details for this number, so presumably it ended it's days many years ago - perhaps lost to the wartime scrap metal drive? Clwyd Motor Co. features in the 1928 RAC handbook. The company is listed as an automobile repairer, and were open on Sundays. They also had cars available for hire. There is a still a company operating in St Asaph with this name - a descendant of the same firm?